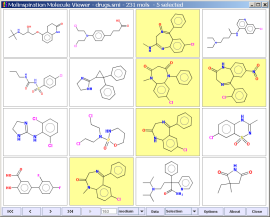 Molinspiration offers broad range of cheminformatics software tools supporting molecule manipulation and processing, including SMILES and SDfile conversion, normalization of molecules, generation of tautomers, molecule fragmentation, calculation of various molecular properties needed in QSAR, molecular modelling and drug design, high quality molecule depiction, molecular database tools supporting substructure and similarity searches. Our products support also fragment-based virtual screening, bioactivity prediction and data visualization. Molinspiration tools are written in Java, therefore can be used practically on any computer platform. 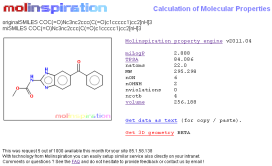 Molinspiration supports internet chemistry community by offering free on-line services for calculation of important molecular properties (logP, polar surface area, number of hydrogen bond donors and acceptors and others), as well as prediction of bioactivity score for the most important drug targets (GPCR ligands, kinase inhibitors, ion channel modulators, nuclear receptors). Number of molecules processed per month exceeds 80,000! More than 4500 Citations in Scientific Papers! Molinspiration software is used by hundreds of cheminformatics experts in industry and academia to produce high-quality scientific results. According to the Google Scholar our tools are more than 4500 times cited! Check the (incomplete) list of publications produced with help of our software. 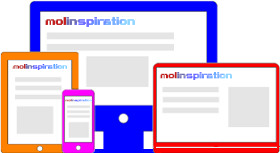 Molinspiration now also on Touch Devices! Molinspiration Molecule Viewer allows visualization of collection of molecules encoded as SMILES or SDfile. SMILES is automatically transformed into molecule 2D representation by our depiction engine. Display of associated data, selection of molecules, built-in substructure search and export of selected molecules is supported. Viewer is written in Java, therefore is platform independent and may by used on any computer where the Java runtime is installed. Ask for free evaluation now!